It was proposed by Pusztai et al. (2007) and it is composed of 2 optimal trials in a Phase II settings. This design was proposed for rapid biomarker assessment in settings where we don’t know the activity of a novel treatment in the unselected population but there is at least one candidate predictor of response. This approach can identify whether the novel treatment is effective in the unselected patients, and if it is not, can tell us if the predictor can enrich the responding population. Only an experimental treatment arm is included in this design and not a control treatment arm, thus this approach can be considered a single-arm approach. Adaptations: Assessment of treatment effectiveness in the entire population at the first stage of the study to make a decision about enriching the targeted patient population. A second phase in the trial design is considered due to the fact that the small number of individuals used in the first phase of the study (typically n1< 25) is likely to include insufficient number of biomarker-positive individuals in order to decide whether the novel treatment benefits this particular biomarker-defined subset. In terms of defining what constitutes a ‘sufficient number’, Pusztai et al. (2007) suggest the use of a noninformative prior distribution for clinical benefit rate of β(1,1) and make recommendations for the early stopping rules. More precisely, Pusztai et al. (2007), given a certain value for the targeted level of activity of the novel treatment (i.e., 25% clinical benefit rate), suggest that the trial should stop early for futility if the conditional power (i.e., the chance to reach the aforementioned targeted level of activity) is equal or less than 7.5% in the following cases: (i) at the first 9 evaluated patients there is no one who responds to treatment; (ii) at the first 15 evaluated patients there is only one individual who responds to treatment and (iii) at the first 20 evaluated patients there are only 2 individuals who respond to treatment. The sample size for this approach is calculated with the same rules as a classic two-stage or Bayesian phase II design where criteria for specifying the sample size are used (e.g. one criterion is to choose a sample size so that if there is no early termination of the trial and the trial accrues the entire population the posterior of the experimental treatment success rate reaches a specified degree of precision). The sample size calculations are discussed in two papers. Although the two stages could be run separately, i.e. one for the biomarker-positive subgroup and the other for the unselected patients, the performance of the study in this way can increase the duration and costs of the trial. Consequently, it will be better to run the study in just one trial so as to have a more seamless study. 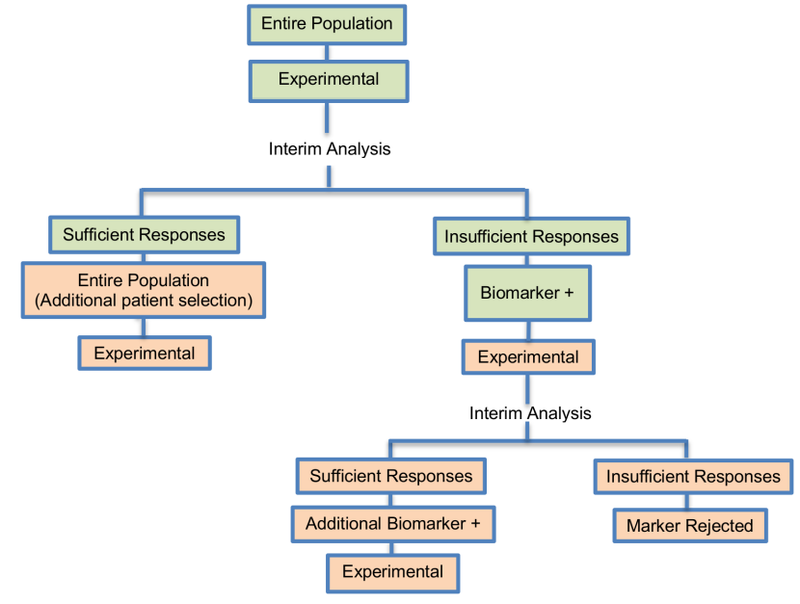 Identify whether the experimental treatment is beneficial in the entire population, and if it is not, then can test whether the candidate predictor can enrich the responding population. Allow for simultaneous testing of multiple different biomarkers for the same treatment in a single parallel multi-arm trial.